RIO DE JANEIRO, BRAZIL – While there are a handful of multi-national jobs that surround a foreign employee with English speakers, the vast majority of Brazilians naturally speak and work in Portuguese. In a challenging business environment, as the country has long had the reputation of a high “Brazil Cost” ailed by bureaucracy, learning the local language is the first step towards working successfully here. 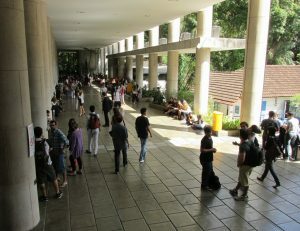 Portuguese for foreigners is available at PUC-Rio, one of the cities largest and prestigious private universities, photo internet recreation. Many international entrepreneurs looking to invest in Brazil, while their economy is in their deepest down cycle in modern history, need to decide when and where they will learn the language. Some opt for classes before even arriving, and then others look for intensive courses once they are here, to learn as fast as possible. For those foreign workers here for temporary work, like the Rio 2016 Olympics, Márcia Håberg, who owns Portugues Carioca, a smaller specialized language school in Leblon, has an alternative focus on immersion to the spoken language. This is especially helpful in Rio de Janeiro where a strong accent can add a “shh” to many words, exasperated when faced with rapid-fire conversations. Intimate classes focused on the spoken Portuguese language can be found at Portugues Carioca language school in Leblon, photo internet recreation. The Portuguese language may seem exponentially more complex to native English speakers, and certainly those that speak another Latin-based language will find the learner curve less steep. Yet with all the nuances, even many Brazilians may not follow all the proper language rules, something that can confound the meticulous student. The type of Portuguese language course one chooses also will depend on location or proximity, cost and general chemistry with the teacher and other students, so taking a trial class is often recommended. Yet the other big factor in learning the language for a job, is what type of work environment you will be in.